Ever wonder what the world looks like from the back of a camel? Well my friends–mystery solved…and now you know. This is the view from the top of a real live Egyptian camel. 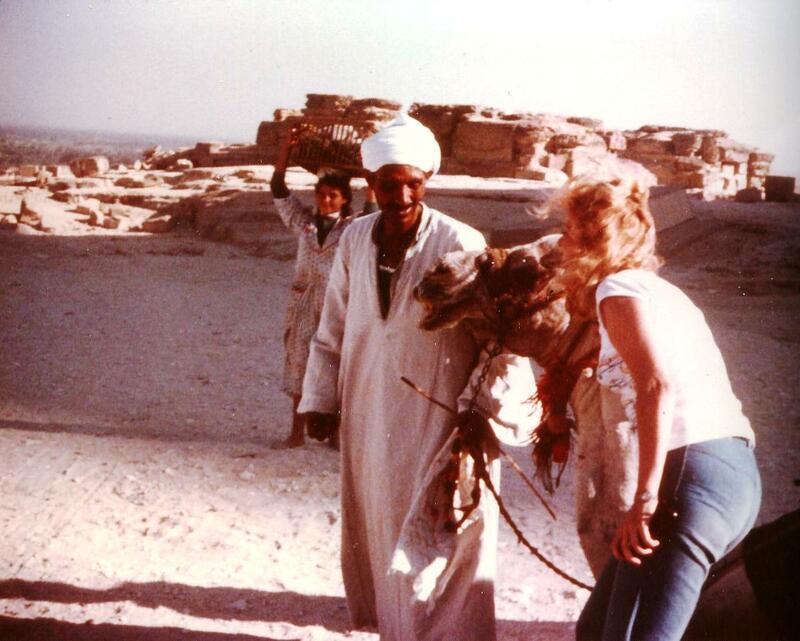 Now this particular dromedary has most likely gone the way of the dinosaur by now–since this picture is about 30 years old…the average life span of your typical camel–but the smelly memories live on…and on. Of course the previously slow, calm creature now discovered his new purpose in life and torn up the hill like there was a bazooka at his back. 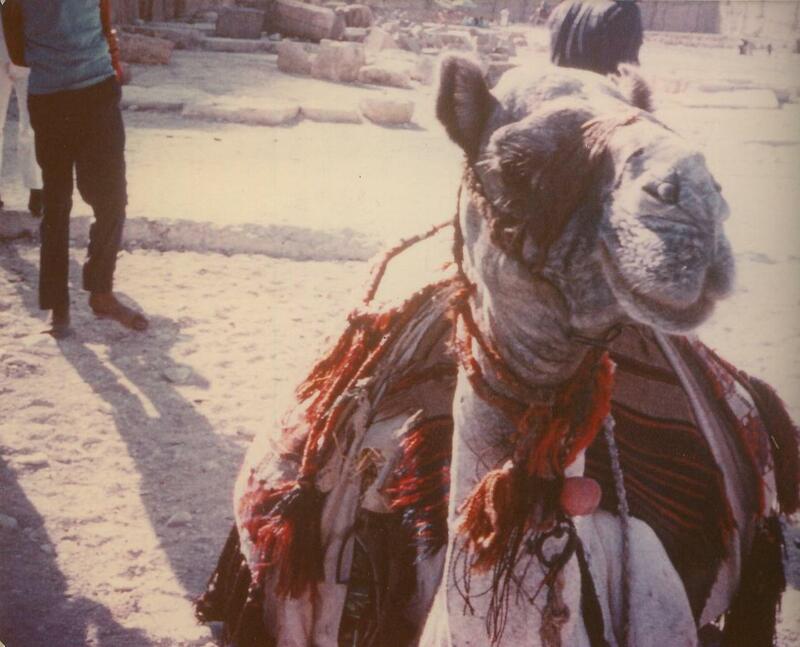 In case you think that riding a camel should be about like riding a horse–let me clue you. Whoever put the running mechanism of the camel together didn’t actually think this through. At first step they pitch forward nearly sending the rider into orbit, but then when the back legs engage, that motion gives you a mighty yank backwards. So instead of a pleasant jaunt up the hill, it turns out to be a strange exercise in 12 forms of whiplash. But I haven’t actually gotten to the good part. Yeah, that’s what I thought. But these smelly, nasty things are creatures of habit, no matter what speed they are traveling. So, the minute we got to the base of the pyramids–this sucker skidded to a stop and dropped to his knees–sending the cockly little rider flying clear over his head. When the rest of the happy caravan showed up, they found the frugal American, laying in a sad, crumpled heap, spitting wads of sand off her tongue. 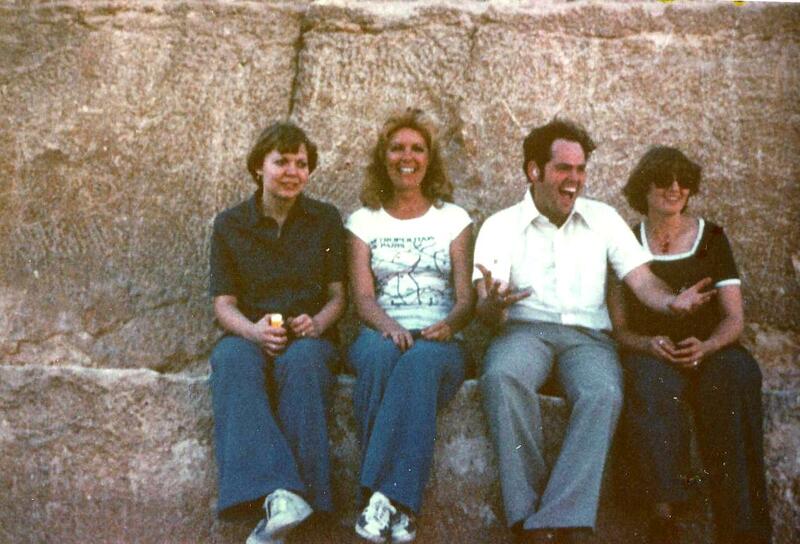 Of course the pyramids were incredible…beautiful…breathtaking…spectacular. Give the herder guy the extra 20 bucks. It’s much cheaper than spending two weeks scrubbing half the Sahara desert out of your ears. Not a big fan of camels. I never knew you traveled so much! That is so cool! Camels are really gross! Man I hope they have videos in heaven because I’d love to sit and watch this one with you. You’re retelling of the event is priceless, I’ll be smiling all day. What a cool story and an awesome adventure! So do you have any stories where you have a good experience with an exotic animal? Thanks for a good laugh that almost had my drink coming out my nose! So did you relive this story to the tour guide? I would have been so mad. Thanks for the great laugh today. I was impressed with the small amount you paid, even back then…. well, that was until you told the ‘rest of the story’. I guess that the money I paid for my kids to ride the camel at the fairs has turned out to really not be such a bad deal. Atleast it has been an uneventful ride. 🙂 Glad you survived to tell us this story. A big “A-men” to that. Oh, that’s right. Entertain yourself with my pain. I’m actually a very serious person…no really. Gives me something to work on. No, I never really told anyone because these third world, foreign countries were really quite scary to me. I imagined if I made a fuss about anything they would “detain” me. That was enough to make me behave very quietly. Seen too many movies perhaps. My camera actually went flying too and broke the back off of it. Luckily, it still worked with some tape. you are HILARIOUS! that is so funny. and i’m just so jealous you went to egypt! what an awesome adventure! i’ve always wanted to go there. Oh my gosh! That was one wild ride! 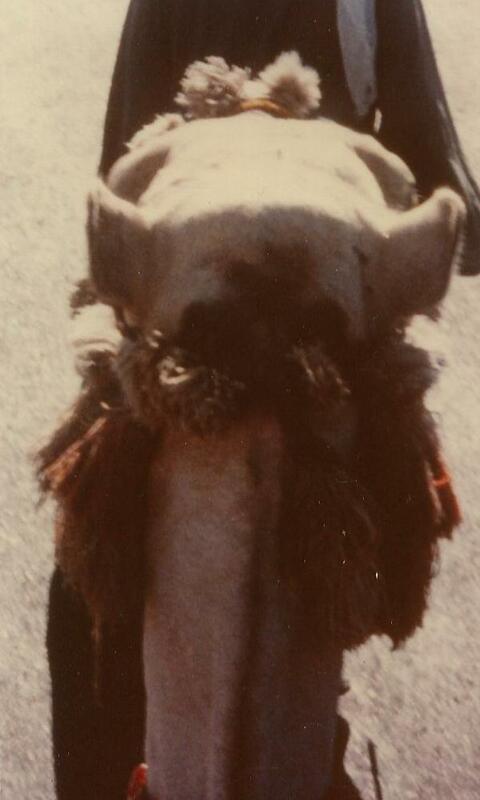 I rode a camel once at the zoo. It was slow, and you are so right about that weird gait of theirs. However, when I got off, he had to nerve to spit on me! I had camel boogeys all over my shirt. GROSS! I am so NOT a fan of camels! It was an interesting place alright. I was ready to kiss the American soil when I got off the plane in New York. Traveling does tend to teach you a great appreciation for order and rational behavior. Me anyway. I’m just sure if a camel spit on me–I’d probably haul off and punch him in the face. Call animal control, if you like. But there’s just something about a badly behaved animal that doesn’t work for me. We teach our children to be have decently, and our dogs don’t get to bite people–so what’s acceptable about a camel trying to kill someone or spitting on people? There’s TOTALLY videos in heaven… there’s some stuff they just can’t describe and record with only a scroll! 😉 Ha ha ha!